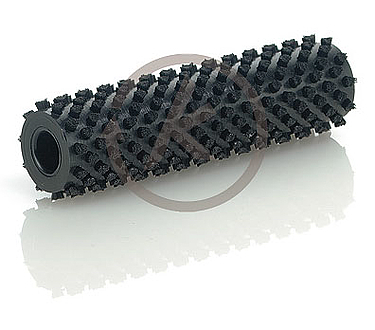 Roller brushes Type 421 without a sub-body are defined as having a body length longer than 100 mm (for brushes shorter than 100 mm, see "Circular brushes"). The comprehensive range of dimensions, core materials, fill materials and fill configurations demonstrates the versability of Kullen-Koti again and again. But you should bear in mind that often a brush with a standard core diameter is more reasonable in price and can be supplied much quicker. The brush cores can be produced with plain bores for shaft mounting, as well as with keyways, dowel pin holes, internal or external threads and reducing bushes. In case of those special requests we would like to ask you to send us a drawing or simply discuss your requirements with our technical consultant. High fill density EA1, normal fill density EA2, low fill density EA3.